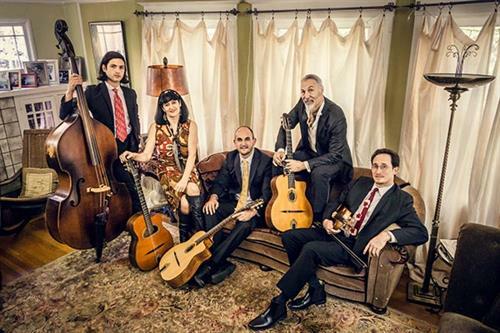 If you loved “The Hot Sardines” last year at BIG ARTS, you will LOVE the five-member Hot Club of San Francisco, a group that honors the rich tradition of gypsy jazz. The Hot Club of San Francisco promises to be the same “standing room only, standing ovation” performance we all enjoyed in this genre of music last year. Paul Mehling, the leader of HCSF, has been dubbed the godfather of American gypsy jazz. He discovered the music of Django Reinhardt and the Quintet of the Hot Club of France in grammar school, and decades later the music that took root in his young soul finally bore fruit. Mehling launched the Hot Club of San Francisco in 1991, spearheading the American Gypsy jazz movement with countless concerts and a series of critically hailed albums, including 1999’s Lady in Red (Clarity) featuring Maria Muldaur, Dan Hicks, and jazz/blues vocal legend Barbara Dane.